Just a few days after promoting Brett Phillips and Josh Hader, the Milwaukee Brewers made the call to No. 1 prospect Lewis Brinson, effectively commencing the team’s bright, bright outlook and future. Phillips was hitting the ball well in Triple-A, while Hader was having his fair share of problems. Lewis, on the other hand, was devastating opposing pitchers. In 204 plate appearances, the newly minted 23 year old posted a 134 wRC+, a .397 on-base clip and a .390 weighted-on base mark. He also mashed six dingers en route to his promotion. He earned his call. Brinson marks the new wave of players coming to Milwaukee. He and Phillips seem destined to man the outfield grass in Miller Park for years to come, but as Brinson is set to make his debut, one must wonder how much playing time he’ll get. Domingo Santana (128 wRC+) isn’t going to lose any at-bats, and Ryan Braun — when he returns from a lengthy disabled list stint — figures to play almost everyday as well. Keon Broxton (79 wRC+) seems to be the odd-man out if the Brewers want to get Brinson and/or Phillips consistent time on the field. But of the two, Brinson is the one who will most likely stay when Braun makes his way back. Phillips could use some more time to improve his plate discipline and cut down the strike outs. With that being said, here’s what RW23 foresees for Brinson in 2017. Compared to Phillips’ projection, RW23 likes Brinson quite a bit more. Depending on Milwaukee’s plan for him, Brinson’s 200 plate appearances might be on the high side, but to me, calling him up to sit him on the pine is a waste of everyone’s time — especially Brinson’s. He needs to be in the lineup as much as possible. This entry was posted in Projections and tagged Lewis Brinson, Milwaukee Brewers on June 11, 2017 by Justin Schultz. Highly regarded prospect Brett Phillips was called up Monday to take over the roster spot of Travis Shaw. But since Shaw is only on paternity leave, Phillips’ stay in the big leagues will most likely be a short one. This is nonetheless exciting, though. Phillips was the main piece in the Carlos Gomez and Mike Fiers trade, and I wrote about that acquisition here. (Keep in mind that I did predict Domingo Santana would be the star of the trade, however). After a quiet season in Double-A in 2016, Phillips has smashed the ball in Triple-A so far in 2017. In 198 plate appearances, the 23 year old has 11 home runs, running a 144 wRC+ in the process. His promotion was obviously well deserved, even if it’s just for a few games. But while Phillips has been a monster at the plate in the minors, he’s still striking out at an outrageous clip (30.3 percent), which should be a huge, flashing warning sign as he enters the majors. That alone is scary, and that alone is why the RW23 projection has little faith him in this season. Phillips is a top prospect for a reason. His defense will flirt with elite — particularly his arm — and he has home-run power and extra-base pop. But his holes in swing are worrisome, and it may take him awhile to get it figured out. Don’t jump off his bandwagon if he struggles to begin his career. If Keon Broxton doesn’t pan out and/or Ryan Braun is traded, Phillips — along with Lewis Brinson — could man the outfield for the 2017 Brewers. He’ll always be a strikeout-prone player, but his defense and power should be able to overlook that. Get excited. The future is here. This entry was posted in Projections and tagged Brett Phillips, Milwaukee Brewers on June 5, 2017 by Justin Schultz. Orlando Arcia still isn’t hitting. He’s had 399 plate appearances, and he’s still not hitting. He owns a career 66 wRC+ and has only managed a base hit on 27 percent of his batted balls. Both marks are well below league average. Now, we before we go any further, we have to understand we really didn’t expect him to make a big impact with the bat. Coming up through the minors, Arcia was known for his glove with his offense a distant second. However, his 66 wRC+ was unexpected, at least by me. I was expecting more of a league-average bat, with an OBP in the low .300’s. But man, Arcia just cannot get going. Arcia is improving. Just take a look at this. Oh wait. This isn’t the right chart. According to this, he’s actually been worse than dreadful in May. Ha! This is a trick. Yes, Arcia has floundered in May, but there’s still reason to believe the 22 year old is improving. 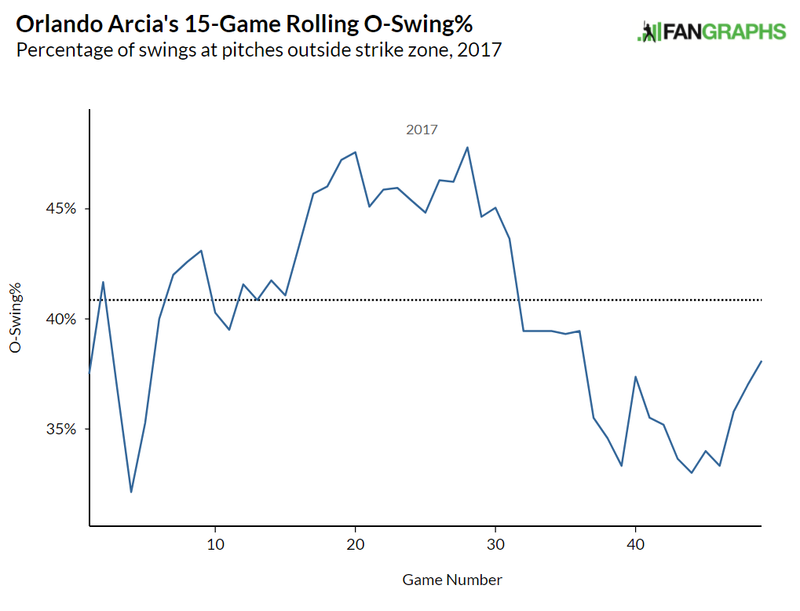 Arcia has dropped his strikeout rate by over 10 percent, improved his walk rate and has gotten on base at a higher clip as a result. His eye at the plate is better, evidenced by his decreased out-of-the-zone swings. Around games 20 to 30, he had a really bad stretch of chasing pitches, but since then, he’s been better than most. Hopefully, this trend continues, and hopefully, with better pitches put in play, his BABIP will rise. Arcia has been worth 0.6 WAR without hitting a lick due to his defense. If he can somehow manage to be just a league-average hitter (100 wRC+), he could be the prospect everyone once loved. But in keep mind, he’s only 22. Patience is a virtue, my friends. This entry was posted in Analysis and tagged Milwaukee Brewers, Orlando Arcia on June 1, 2017 by Justin Schultz.